On a daily basis, we’re exposed to confidential information and documents we’d rather not let the general public see. For a business, this can be private client files, financial information older than seven-years-old and therefore no longer needed to keep, or just files that have been printed but are too confidential to throw in the trash. Even at home, we find ourselves armed with documents that we would prefer are kept to ourselves. From utility bills to credit card statements and even old credit cards, many things just shouldn’t be thrown out in the trash. As such, it’s helpful to have a paper shredder that can take care of anything that’s not suitable for the general trash bin. We’ve listed nine top-rated paper shredders below that will more than cater to your requirements. If you need a hard-working paper shredder that will sit nicely under any desk in your office, this AmazonBasics paper shredder might just tick all the boxes. It’s a high-security micro-cut shredder that can not only take care of 12 sheets of paper at a time, but can also make short work of credit cards, DVDs, and CDs. For your peace of mind, you can benefit from the knowledge that the paper is shredded into tiny 5/32-inch x 15/32-inch pieces, at a rate of six feet per minute. As such, you can spend minimal time shredding, and more time working. 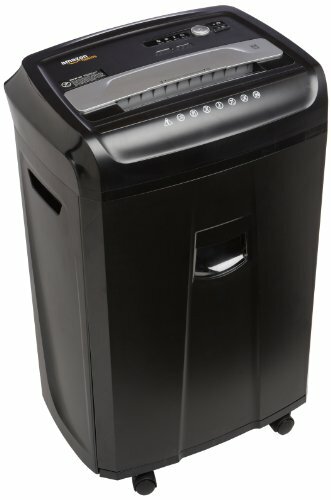 This paper shredder also offers eight minutes of run time, followed by 45 minutes of downtime to allow it to cool down. It also provides an auto start and manual reverse function to clear any paper jams that may occur. The shredder is also fitted with a 6.7-gallon bin to house the paper and comes with a 1-year warranty. For any office, this shredder will tick all the boxes. 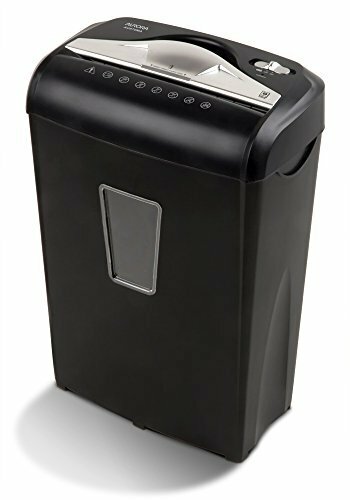 Whether you work in an office, or you have confidential documents at home, you might consider purchasing this AmazonBasics paper shredder. 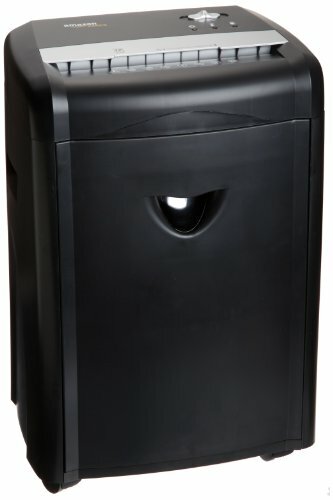 Small, compact, and affordable, it can suit any office or home environment that requires the odd document to be shredded. As a high-security micro-cut shredder, it can make short work of eight sheets of paper at once, or credit cards, CDs, and DVDs. It shreds these into tiny 5/32-inch x 15/32-inch pieces, meaning your document and credit card privacy need never be compromised. 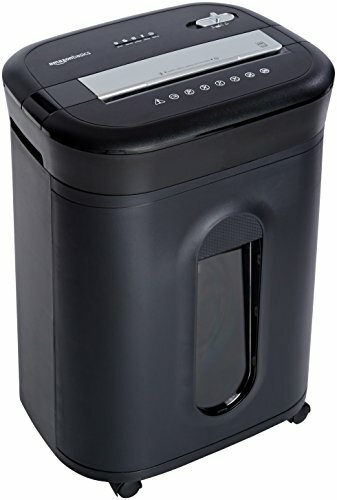 This paper shredder also provides the user with two minutes of continuous run time and then shuts down for 40 minutes to cool down. It also has an auto-start and manual reverse function to help take care of paper jams. A three-gallon bin will provide all the space you need, and it even has a 1-year warranty for peace of mind. If you’re tired of your old paper shredder spending more time jamming than shredding, it’s time to upgrade to this powerful shredder from Fellowes. With a 100 percent jam-proof system, you never have to worry about clearing paper jams again! What’s more, it features SilentShred technology, enabling you to shred to your heart’s content without bothering your coworkers in a shared space. Even the electricity bill payer will be relieved, with an energy savings system on offer to provide optimal energy efficient when it’s on and off. Most importantly, this shredder takes care of all highly classified documents in the safest way possible. It shreds 16 sheets of paper into 5/32-inch x 1 ½-inch pieces, all the while featuring SafeSense technology to stop the shredder when your hands touch the paper opening. This affordable paper shredder more than meets the mark. 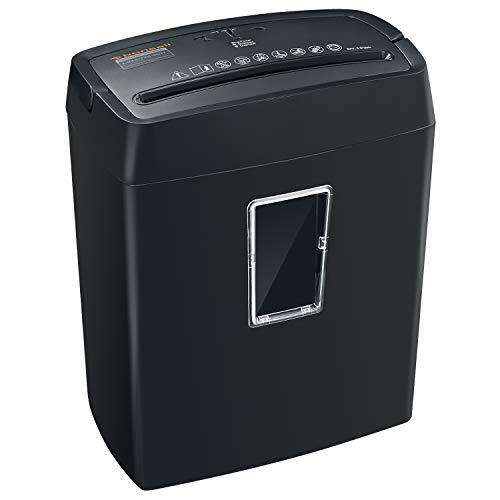 Time is money, and when you need a paper shredder to take care of your documents quickly and efficiently, this paper shredder from Fellowes is the answer. Most shredders make you go through all the documents to ensure there are no paper clips or staples, but this one will power right through them. It won’t falter or jam, and can even make short work of 18 sheets of paper at a time, junk mail, CDs, and DVDs. It will run flawlessly for 30 minutes before needing a cool off period of 40 minutes, and will even shut off if your hands touch the paper opening. A large 9-gallon bin with full indicator also ensures you spend less time emptying it than shredding. So much convenience is on offer with this shredder. Choose this Fellowes power shredder if you require a small, compact paper shredder to sit comfortably beside your desk in the office. While it can only handle 11 sheets of paper at a time, it shreds it instantly, and can also be used to cut up credit cards, as well. For your peace of mind, all documents are shredded into 5/32-inch x 1 3/8-inch pieces, and it also has a patented SafetyLock that can disable the shredder if needed. It will run for up to five minutes at a time and provides reliable shredding services when you need it the most. 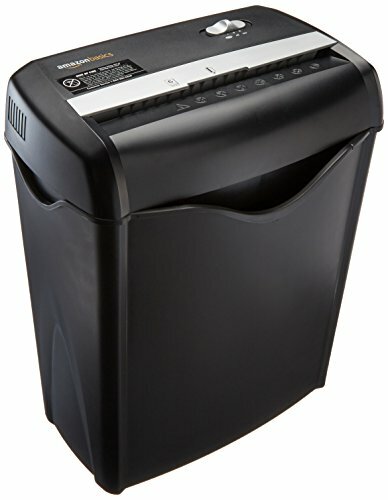 This Swingline Paper Shredder will more than meets your needs as a homeowner, or an office employee. It can shred up to 14 sheets at a time – including unopened junk mail – and this then sits in a five-gallon waste bin that’s easy to empty when it’s full. 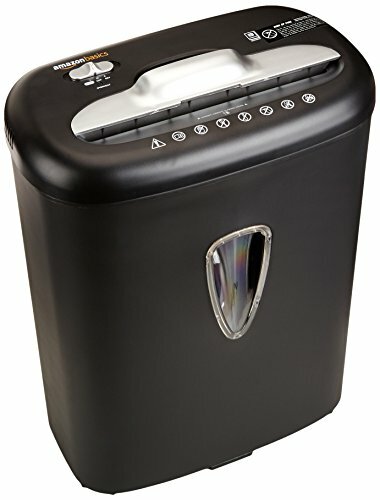 Aside from paper, this shredder can also take care of DVDs and CDs through a separate cutter. Unlike most shredders, the separate entrance reduces wear and tear on the primary shredding teeth, extending the life of the shredder in the process. It’s easy to use, stylish and fits nicely under any workbench. All documents within a business must be kept for seven years, but after this time, you can destroy them. 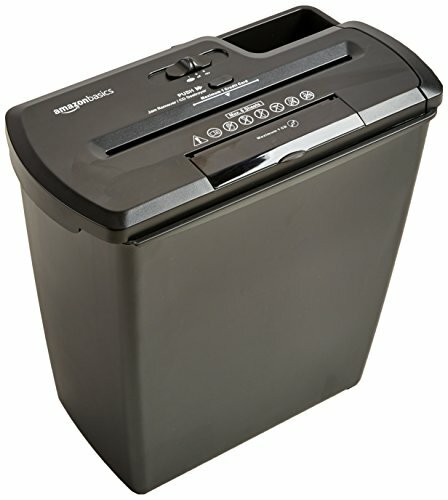 This Fellowes Paper Shredder will make short work of what can often be a mammoth task. Not only can it accept up to 22 sheets of paper per pass, but it also shreds staples, paper clips, CDs, DVDs, and bulky junk mail. As such, you can save countless hours of sorting. This shredder is also exceptionally powerful, with a continuous duty motor for non-stop shredding. Instead of waiting for it to cool down, you can continue to power through, benefiting from a 100 percent jam-proof system, as well. This high-volume machine is the crème de la crème of shredders, and it’s a must-have for any office. This heavy-duty paper shredder on wheels from Bonsaii will be a welcome addition to any office. It offers an hour of continuous run time thanks to the advanced cooling system, and it can handle up to 18 sheets at a time, as well as staples, credit cards, DVDs, and CDs. It runs smoothly and quietly to avoid annoying your colleagues and has four caster wheels to be easily transported around the office. 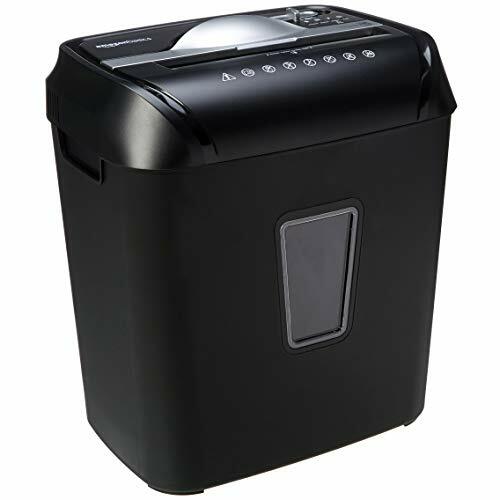 This shredder is a machine of convenience, for it also offers a six-gallon paper bin for less frequent emptying, all the while providing auto-start and auto-reverse features to avoid frustration with jams and overheating. If a large shredding job lies ahead of you, you need a paper shredder that will run continuously, with minimal downtime. This Bonsaii shredder ticks all the boxes. It can run for up to four hours without needing to cool down and handles ten sheets of paper at a time. It will power through 7.2 feet per minute of paper, staples, CDs, DVDs and paper clips with ease, all the while being exceptionally quiet, as well. It also offers a premium jam protection system for less downtime, as well as an auto-start and auto-reverse feature for your convenience. Furthermore, you can benefit from the large 7.9-gallon bin that requires less emptying than a conventional shredder.